The KT 150 Watt Mono-crystalline Solar Blanket is a compact, light-weight solution to your solar needs. 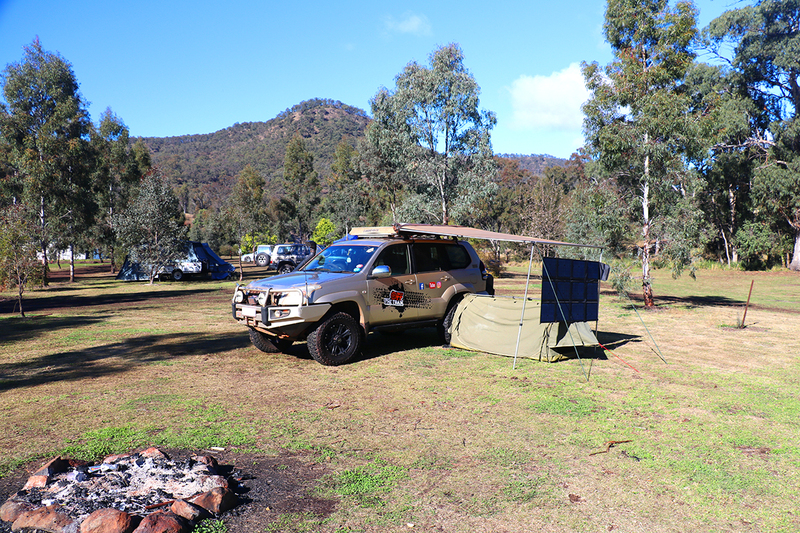 Ideal for camping, 4×4 and marine applications, the KT 150 Watt Portable Solar Blanket is manufactured from a solar cell that is cast from silicon. These cells are more efficient in producing power than most other panels, so the size of the panel is smaller yet produces a greater power output. This one-piece, easy-fold design folds down to a compact bag with all accessories neatly tucked away inside. The panels feature a scratch-resistant mat coating for durability and folded tabs which allow you to secure the blanket to your vehicle and close the doors over the tab to reduce the chances of theft. The ideal size and weight! 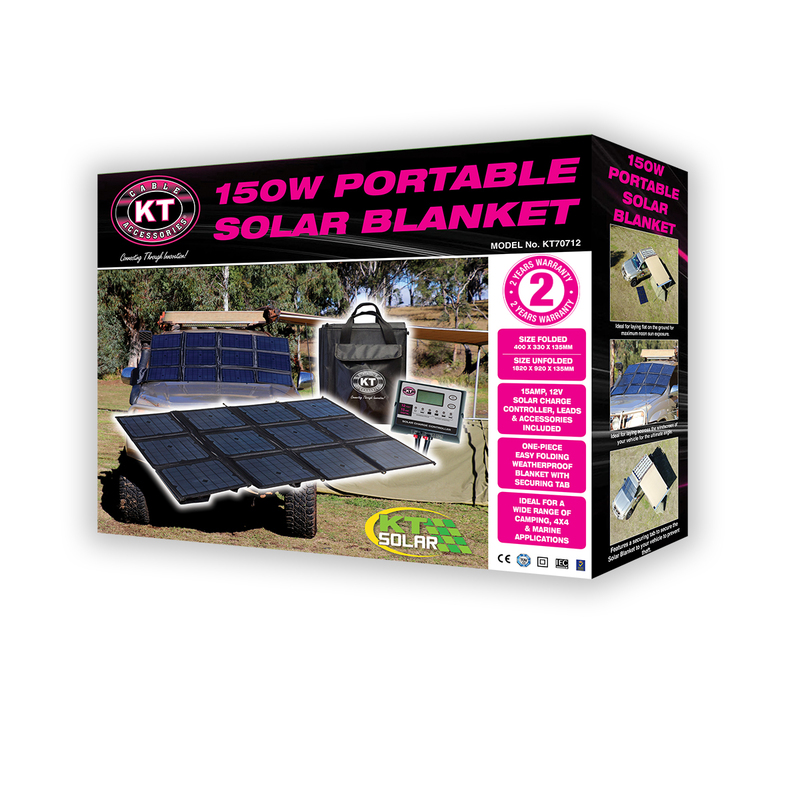 KT 150 Watt Portable Solar Blanket unfolded is 1820mm x 920mm x 135mm and folds down to a convenient 400mm x 330mm x 135mm in size. Only 6.3Kg in weight, this kit is light and easy to transport. This kit includes a 5M Power Lead with easy connections to power (2.5mm2 Twin Core Cable) and 55cm Power lead with positive and negative battery clamps for easy connection to battery (2.5mm2 Twin Core Cable). KT 150 Watt Portable Solar Blanket can be used in a variety of different ways and features loops along one side to allow the blanket to hang up. 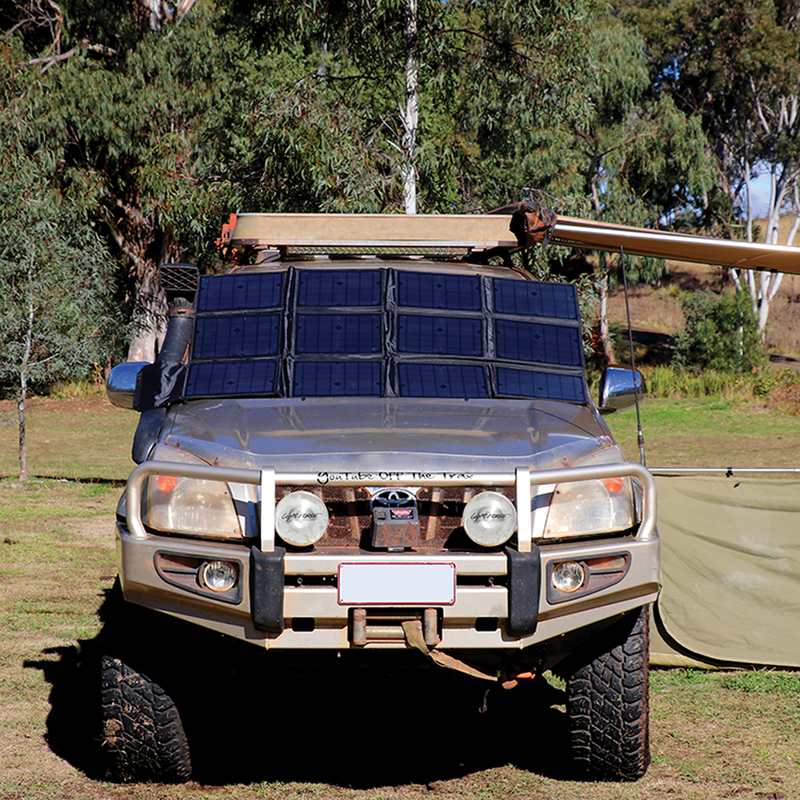 The most common use for the Solar Blanket is placing over the windscreen of a vehicle which provides the perfect angle for optimum solar exposure. KT 150 Watt Portable Solar Blanket is designed to charge LifePO4, LTO (Lithium Titanium Oxide), Gel, AGM, Conventional Lead-Acid (WET) and Calcium Batteries. The 15Amp, 12V Solar Controller fitted to theKT 150 Watt Portable Solar Blanket will regulate the solar charge and is IP67 Rated – Waterproof. The Coloured LED’s provide easy indication of the operational status and battery conditions. The Digital LCD display shows battery voltage, charging current, charging capacity (Amp Hour), battery types , full charge and fault codes. The Multi-charging function protects against reverse polarity, short circuit, over temperature, and over voltage. The solar controller prevents batteries from being undercharged. In the solar field, battery undercharge always occurs, especially on some conventional lead-acid or calcium batteries. The unit provides an automatic equalisation feature for deeply drained conventional lead-acid battery or calcium batteries as well as provides a cycling automatic equalising feature every 28 days. This Solar Charge Controller can be connected to the battery permanently to keep the battery fully charged by using a process called ‘floating’. This means the controller will stop charging when the battery is full and will automatically start charging the battery as required. This process will also reduce water loss and help prevent the battery from drying out. This Solar Charge Controller also protects your battery from discharge at night. Under low light or no light, the solar panel voltage could be less than the battery voltage. 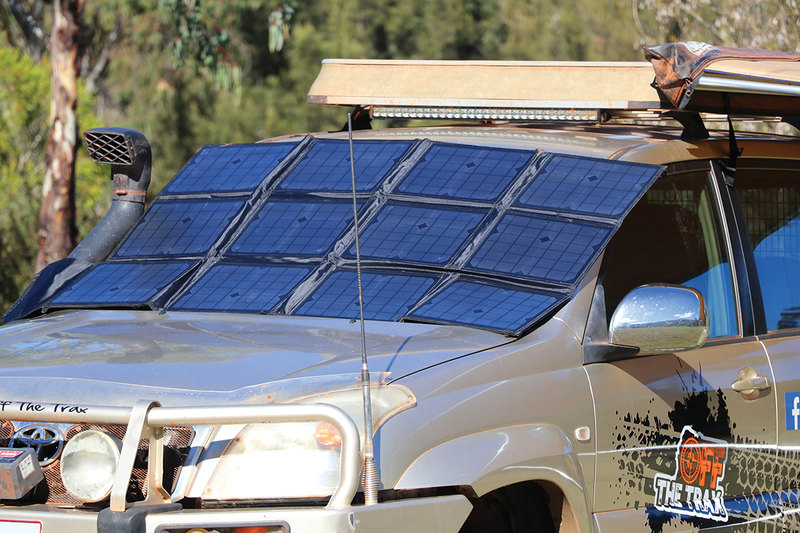 The unit features a special circuit which prevents current flowing back from the battery and into the solar panel. TheKT 150 Watt Portable Solar Blanket can be hung as displayed above. Contains loops to secure the blanket. Image Credit: offthetrax. 1 ) Can the KT 150 Watt Portable Solar Folding Blanket be mounted to a roof or wall? Yes, the panel can be mounted to a horizontal surface such as a roof or on a vertical surface as long as the panel receives full sun exposure for a reasonable period of the day. You will however gain better performance if the panel is tilted toward the sun and faced in a northerly direction. This enables the maximum amount of solar energy to reach the panel. 2 ) What current output could I expect? The current (A) of the solar panel is based mostly on the available solar energy (sun rays). The current ratings (Peak Power) given in the specifications table are based on the ‘ideal’ sunlight conditions. In reality, this may be achieved only on a very bright sunny day. The normal current output will therefore be a little lower. If the panel is shaded or used on a very hot day, the output will decrease further. 3 ) Is the panel suitable for charging my flat battery and how long will this take? 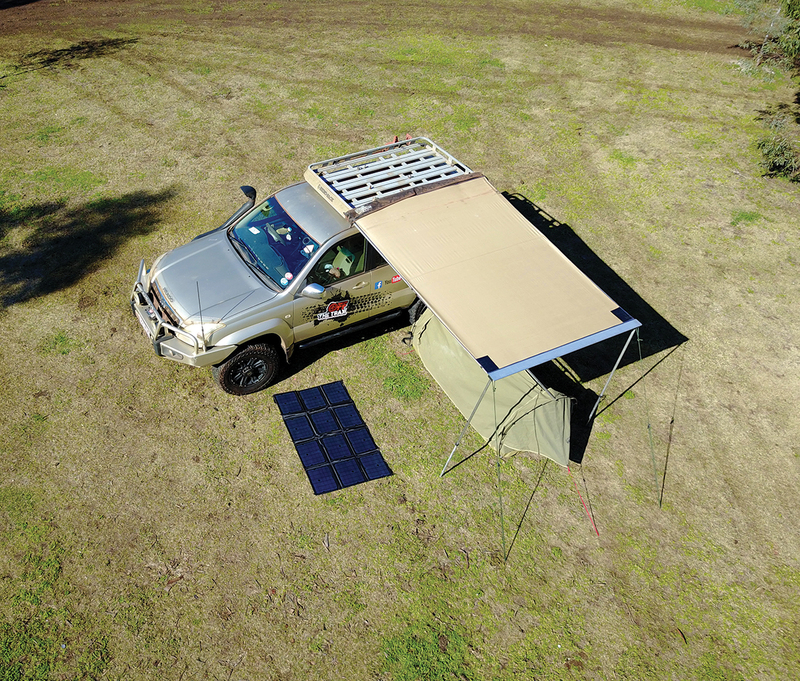 The KT 150 Watt Portable Solar Blanket will charge flat 12V batteries (above 9V) 250-1800CCA (Automotive) with a charge depending on the battery size. Are you a business inquiring to purchase bulk, or stock this product? Contact us using the below contact form. Find a stockist in your selected state.